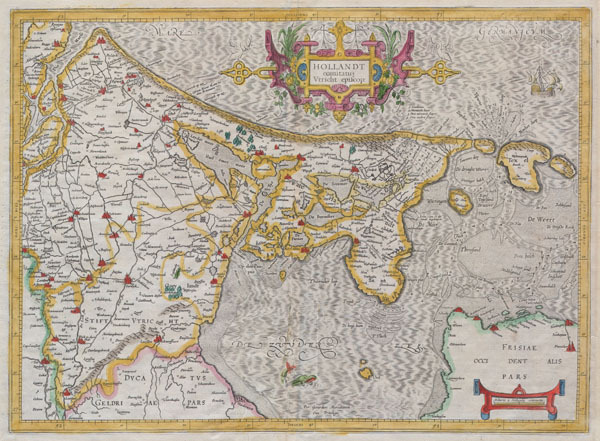 A rare and beautiful 1606 map of Holland ( Netherlands ) by Gerard Mercator. Amsterdam appears at the center and the map extends south as far as Harderwyck and west as far as Rhenen and Rotterdam. The Zunder Zee, now a damned inland waterway, occupied the lower center of the map and a sea monster lying in wait for unwary ships – one of which sails in at the top right of the map. Elaborate title cartouche top center. Very good condition. Minor expert centerfold repair near the sea monster. Minor marginal repairs on verso. Else clean. Original platemark visible. French text on verso. Van der Krogt, Peter. Koeman's Atlantes Neerlandici, vol. 1. 't Goy-Houten: HES Publishers,1997.